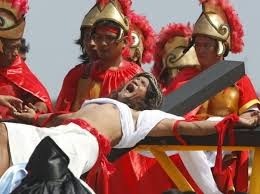 The Holy Week is one of the major events in the Philippines and Filipinos observe it in different ways. To the religious, it is the most awaited time so that they can perform penance for the forgiveness of their sins. To some families, it is a time of coming together and spending some few days with each other, at home or in some resort or a vacation site. To the employee, it is a time to take a few days off from work and enjoy the quite of the city as the traffic is almost zero. Truly, if it is not a time of grief and sorrow, Filipinos would be lighting fireworks but that would be sacrilegious. Here are some words you would likely hear during this season so it pays that you can understand and talk about them as if you have taken Catholicism 101, so to speak. You can practice (or as my other students would say, 'bansay-bansay') them so that you will be using them in your conversations.